Empidog at Flanders with a cycling cap. 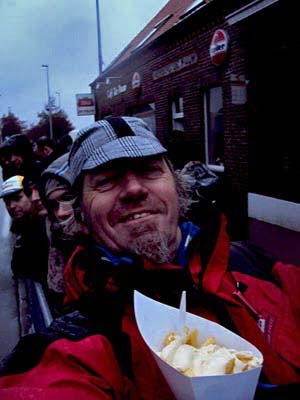 Steve combats the harsh weather with a Galstudio winter cycling cap avec frites & mayo! He said, "It kept me ears warm!" This past weekend in windy and rainy Flanders Steve aka Empidog sent me some images of him sporting a Galstudio cycling cap. That's the closest, that our caps have been to the Flemish pavé. He was over there with Team Flavio to support their young riders for a weekend of racing. Big thanks to Steve and I like the cycling cap & frites/mayo in action. And, NO he didn't have a beer in the other hand! 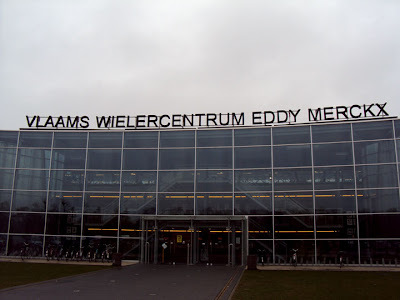 Steve visited the Flemish Cycling Centre Eddy Merckx! Another one of the many reasons to visit Flanders.